Whenever at a cafe or breakfast joint, I always check the muffin display to see if any are labeled "vegan". It's very, very rare that I see a vegan option. So, like anything in this world, don't expect someone else to give you what you want. So yea, I'll bake my own. 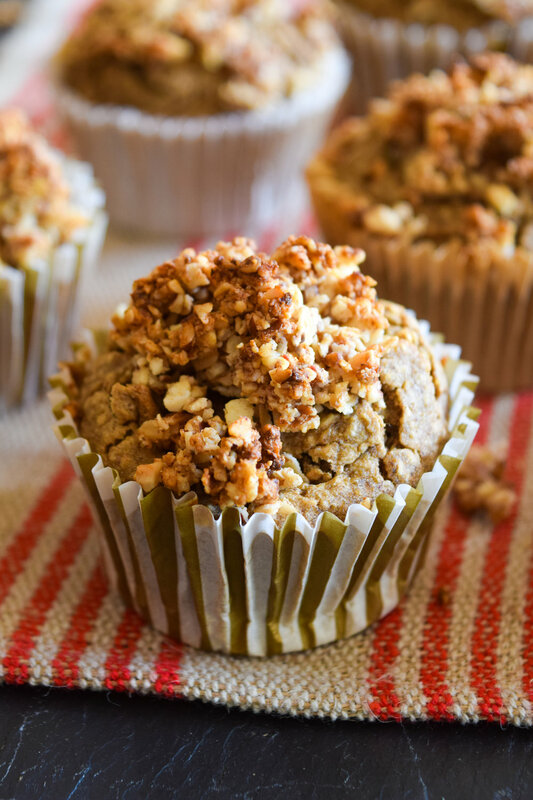 These banana oat muffins are deliciously sweet and healthy. They're a perfect breakfast, snack or dessert. Try slicing the muffin in half and smearing on some of my Maple Cashew Butter! So yummy. I love the slight banana flavor of these muffins but the real star of this recipe is the sweet and crunchy topping made of dates, cashews and pecans. It's so good and the smell of it while baking in the oven is mouthwatering. Preheat the oven to 375 degrees Fahrenheit. Line the muffin pan with liners. Add the oats to the food processor and blend until it turns into a flour. Next, add the cinnamon, salt, baking powder and mix again. Pour the dry ingredients in a large bowl and mix in the almond milk, maple syrup and smashed bananas. When completely combined, use a measuring cup (I used a 1/3 cup) to scoop the batter into the muffin liners. While the muffins are baking, wash the food processor and then mix together the ingredients for the topping until it resembles a crumble. After the muffins have baked for ten minutes, pull them out and put a teaspoon of the topping on top of each muffin and then put back in the oven for another 15 minutes (25 minutes total) Stick a toothpick in a muffin, if they are done baking, it will come up clean. Let the muffins cool before eating. Store in an airtight container for up to a week.